You must make reservations at least 5 minutes in advance of the time at Carmine's Steakhouse. Complimentary Valet Parking at the Corner of 4th and Walnut Street. Carmine's Steak House, located in the heart of downtown St. Louis in the new Drury Plaza Hotel, promises and delivers the finest in aged steaks, hand-cut chops, rack of lamb, chicken and seafood entrees, as well as Lombardo's signature toasted ravioli. With private rooms that can accommodate up to 170 people and nightly complimentary valet parking, Carmine's offers convenience for tourists, business meetings and local diners alike. Hello Cardinal Fans we will be open on HOME OPENER 4.4.19 @ 11:00 A.M.. Went there for 50th birthday and it was incredible! Great food, service and atmosphere! Highly recommend! Great place, you won’t be disappointed!! 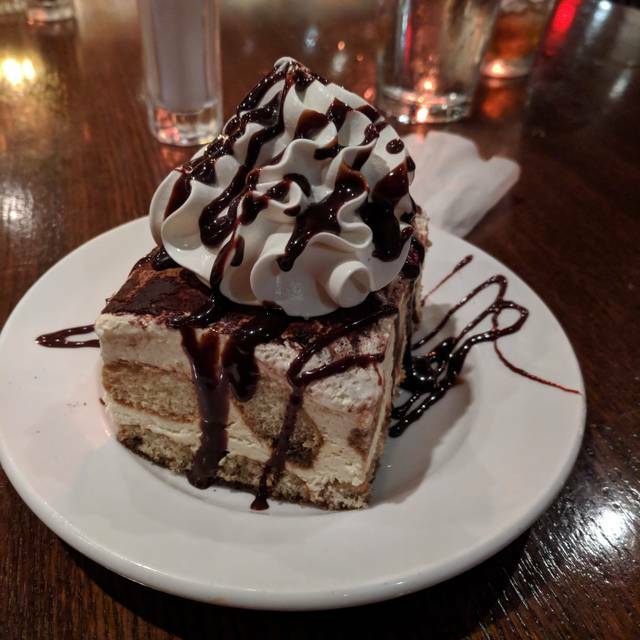 From the wine and phenomenal appetizer through the perfect steaks and on to the delectable dessert, this is without a doubt, the best of St. Louis. It is guests like yourself that we rely on to let us know when we accomplish the goals of great food and service and when we fall short of those goals and need improvement. It doesn't sound like we could have done any better during your visit and we really appreciate the high marks and flattering review. Come back any time! We went to celebrate our anniversary. It was a wonderful meal, probably the best I’ve had in many years. Everyone was thrilled with their appetizers and entrees. The dessert was delicious! We will be back. Your review is greatly appreciated. Thank you very much for taking the time and letting us know how your visit was. It is great to hear that you enjoyed your experience, especially appetizers and dessert. Please come back and see us any time you are in the area. We look forward to seeing you again soon. Excellent steaks. Huge portions - none of us could finish our twice baked potatoes. Friendly, knowledgeable server. Thank you very much for the kind words. It sounds like we achieved all the goals of Great food, great service, great experience. We are happy to provide you with all of them! Please come and see us again! The food and service was fabulous! I made a reservation for my husband’s birthday dinner. What a great experience! The food was amazing and the service was perfect. Our waiter, Gary I believe, took great care of us. We had cocktails, a crab cake appetizer, the filet mignon special with crab, and a lovely birthday dessert. A wonderful meal for our special occasion! I highly recommend Carmine’s! We are glad to hear that you had a great over all experience. We are extremely thankful for the great review. The quality of service can separate the good restaurants from the great ones. Gary has a great personality, he is very great with the guest . We would love to see you next time you visit St.Louis.Thank you for your time. Superb service, great selection on menu. We greatly appreciate you taking the time out of your day to give a great review. Hope to see you in the near future. 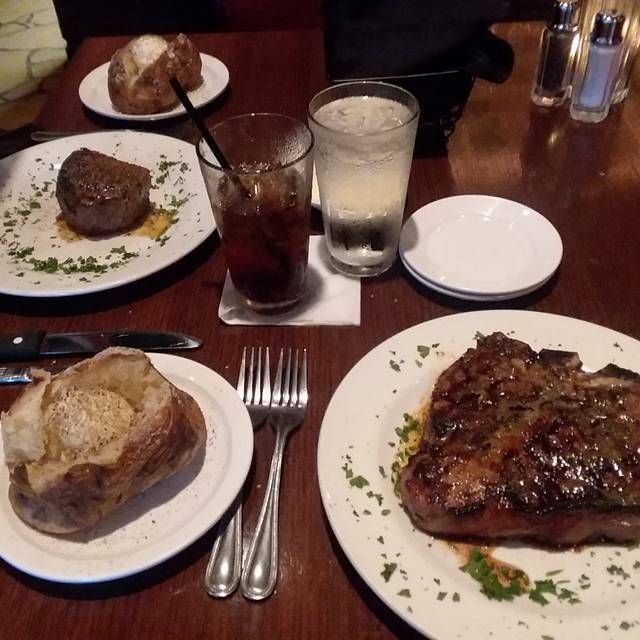 Carmine's is hands down the best place for a steak in downtown STL. The service is spectacular and the food is top-notch. If you are in town and looking for a great experience this is where you need to go. Food was delicious, service was good! Ambience was lacking, but would definitely recommend friends to eat here! Amazing food and service. Perfect for a fancy date night out. Decided to try a steak place on a short weekend visit to St. Louis. Carmine's was good, but it wasn't great. Made a reservation and noted there were several available. When we showed up, the main dining room was half full. We were led to the very back of the restaurant that appeared to be used for overflow and special events with a big screen on the wall. Unlike the front part of the restaurant, the walls were a very dark grey. The room completely lacked ambiance. I have no idea why we were led back there especially since the front of the restaurant never filled up. I should have asked to move, but decided not to be difficult. We would have actually waited at the bar even if it meant eating later just to not have to sit in the back room. 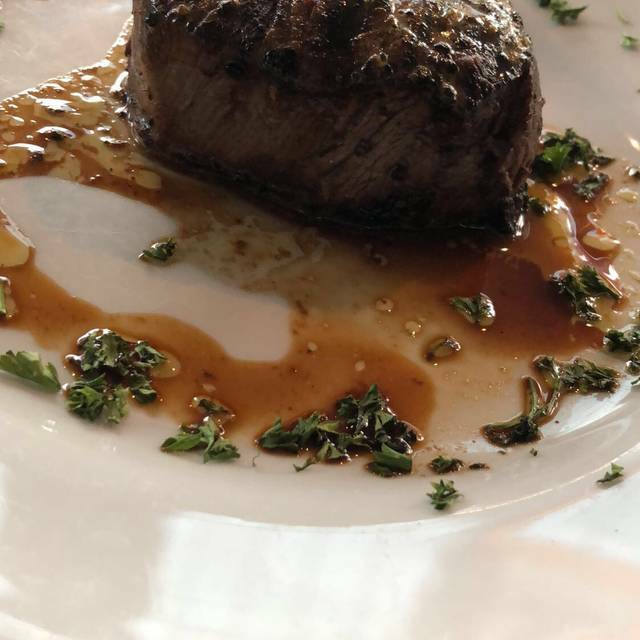 The food was good but for the price of the steak, I expected better. I had the bone-in rib-eye and the sauce was tasty, but the steak itself was average. My wife had crab cakes that were underwhelming in taste as well. We had a red velvet cake for desert and the cake didn't taste very fresh. The service was excellent. Our waiter was truly attentive. He did a great job of taking care of us, while not interrupting at awkward times. I left a great tip because he sincerely deserved it. This was a very pleasant surprise. 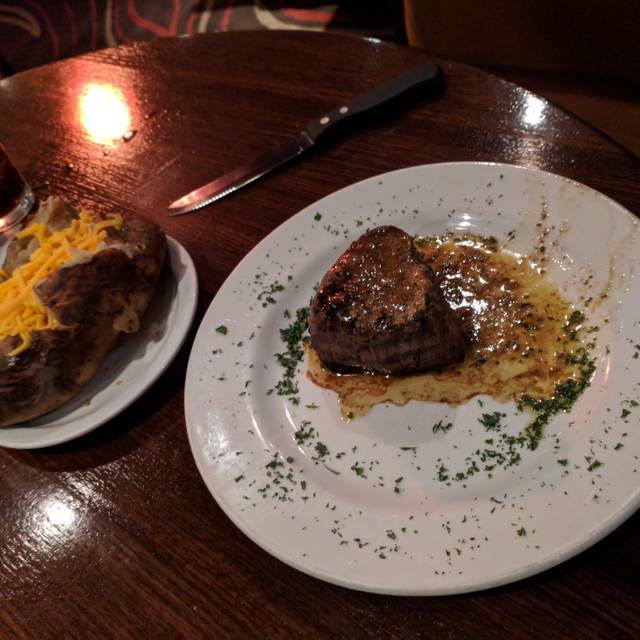 The steak was as good as any I have ever had and the service was outstanding. It was expensive but no more so than any ezcellent steak house. Carmine's (part of the Lombardo's family of restaurants) has the best toasted ravioli in St. Louis, so that is always the go-to appetizer. While I normally enjoy a pepperloin, tonight it was the special halibut. The fish was excellent. And, although our server was new, he did a great job. Very good food and experience. 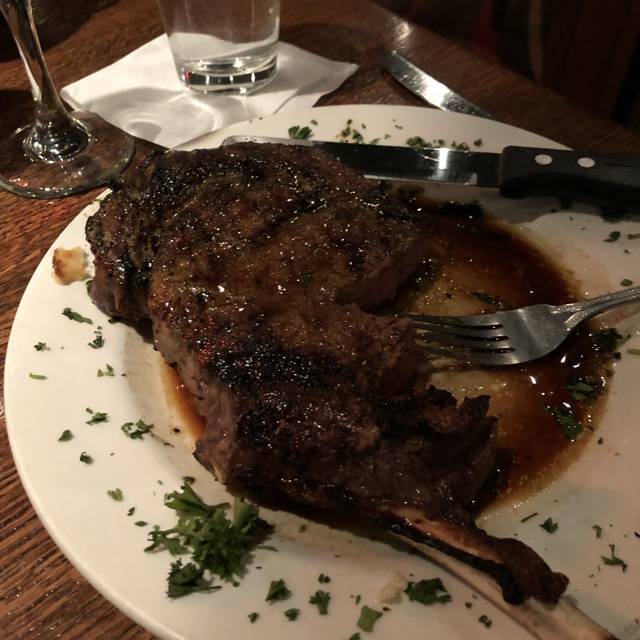 Glad you enjoyed such a great experience with us at Carmine's Steak House. Our server, Anthony, was fantastic. We were lucky to have him. The Filet Mignon and veal chop were spectacular. Such great flavor! The twice baked potatoes were huge & delicious. 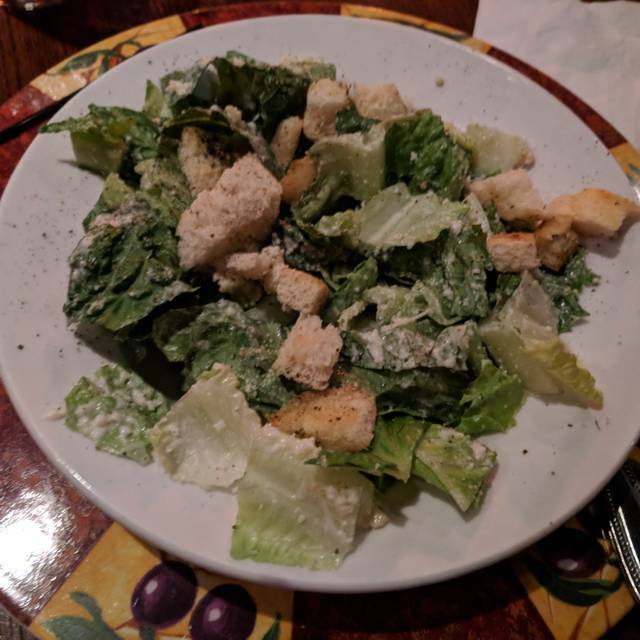 The house dressing was great. The toasted raviolis are a MUST. Staff was friendly and attentive. Highly recommend. We always welcome the opportunity to compliment a visit to St. Louis with a great dinner experience. 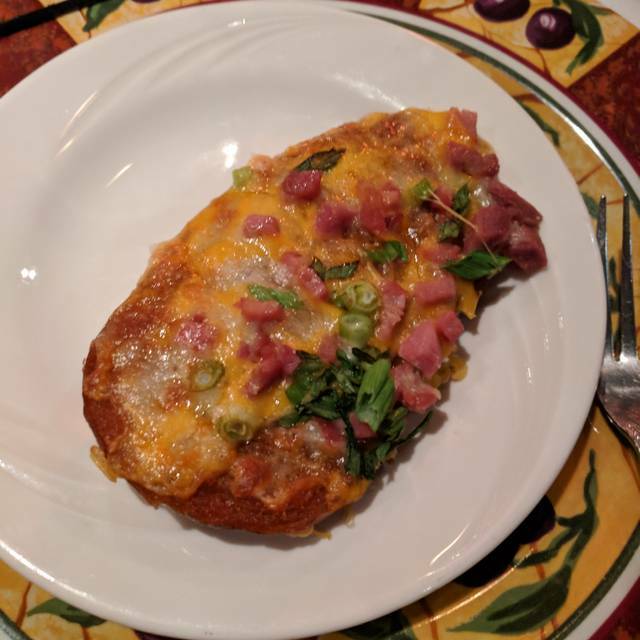 Enjoying toasted raviolis is part of St. Louis experience and so glad you shared it with us. Anthony is a great asset to Carmine's. It is wonderful to hear that your visit to our restaurant was amazing. Please come back and see us again next time you are the St.Louis area. The evening was wonderful from the appetizer to the dessert. Carmine's still makes their own toasted ravioli and it is awesome. Salads and sides were terrific. Steak was flavorful and perfectly prepared. Dessert stand-bys of creme brulee and cheesecake were a sweet finale. Service was friendly and attentive. Atmosphere is relaxed elegance and quiet enough to actually have a conversation. We will definitely be back! Your review is greatly appreciated. Thank you very much for taking the time and letting us know how your visit was. It is great to hear that you enjoyed your dinner experience and dessert for the finale. Please come back and see us any time you are in the area. We look forward to seeing you again soon. Great place to eat, the food & service was outstanding. That you for taking the time out of your day to give us such a great review. Amazing food! Definitely will return next time I'm in town. Great experience! Thank you very much for the kind words. We appreciate you taking the time to give us some feedback on your experience. Please come and see us the next time you are in St. Louis for a great treat. Business meal from out of town. The food and service were amazing! Great service & awesome food! We will definitely be back! A little pricey but worth every penny....The food and service was top notch and I will be returning every year for our anniversary. 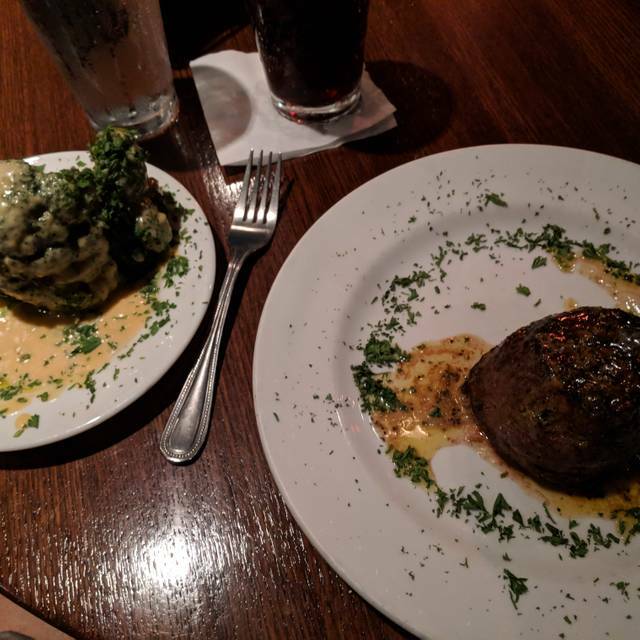 The lobster bites, the filet with twice baked potato and desert was truly amazing. Thank you very much for your rating and review. We appreciate your input. It was wonderful to hear that you enjoyed all aspects of your dinner and look forward to seeing you again at least once a year on you anniversary. We strive for the best service possible to every guest. Thank you for your feed back. This meal didn’t disappoint! Toasted ravioli were amazing and nothing beats a Carmine’s filet! It is our goal everyday to serve the finest quality of food. Thanks so much for the wonderful feedback. We greatly appreciate it and glad you had excellent experience. Delicious! We had a nice dinner, never felt rushed and the steak was superb! We really appreciate you taking the time to tell us how your experience was. It is great to hear that you enjoyed every aspect of your time with us. Hope to see you soon! Great Food look forward to always going back. Desserts are excellent as well. Thank you for taking the time out of your day to give a great review. Took my girlfriend for our 2 year anniversary and it was amazing! Our server Rebecca was very kind and served us very well throughout the whole night. We both had steaks. One medium well and one well done. They were cooked perfectly to our liking! Desert options were shown on a platter and we chose the gooey butter cake. Overall a great experience and will dine again! Everything about Carmine’s was amazing. They were very courteous and accommodating! And the food was absolutely amazing! Thank you again and we will definitely be back! 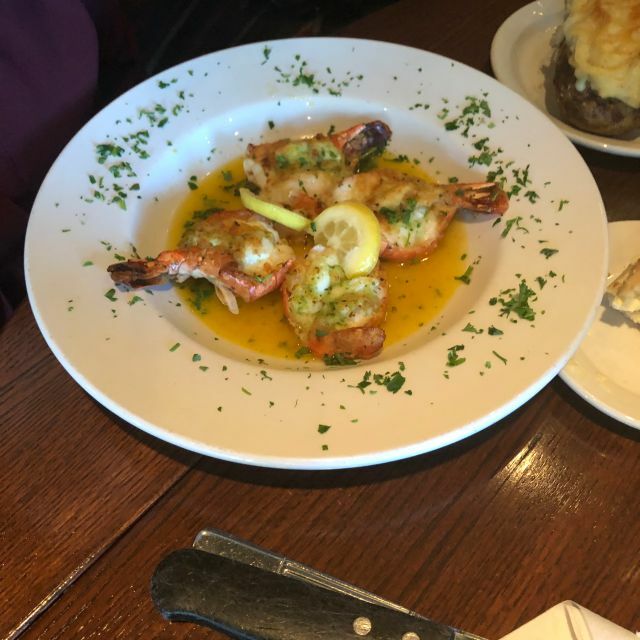 We pride ourselves on great food and great service and it sounds like you had a great time experiencing both! We thank you for giving us the opportunity to provide you with such a great evening and would love to see you again the next time. Thank You so much for the positive feed back. Went here for the first time for my wife’s birthday. The food was great and the service was perfect. They even consulted the reservation and saw it was a birthday celebration and brought a piece of cake for my wife. Thanks to the whole staff for a special evening. We are so glad to hear how awesome your wife's birthday dinner was. Here at Carmine's we strive to make everyone feel special with great food and service for any type of celebration! We hope to see you for your next special evening here at Carmine's. Waiter staff was on point! Thank you so much for taking the time to write us such a great review. Fantastic! We had the lamb chops, filet Carmine and the fish special. All delicious and service was impeccable. Will definitely go back next time we are in town. We had an awesome meal and great service from Kevin. The steaks were amazing. We had a large group and ended up in a private tool which was perfect for talking. A great experience to have on another trip. We went in to celebrate our 41st Wedding Anniversary and were treated like royalty. The greeters and the wait staff were super awesome. The food was prepared to perfection and we were very pleased. We wish we lived closer to enjoy Carmine ‘s more often. Thank you so much for your feedback! We think all of our guest are royalty. It is our pleasure to make your night special, and we look forward to seeing you for your 42nd! Amazing food and one of the best steaks I’ve enjoyed anywhere across the world. Nice ambiance and terrific service. Short, sweet, and to the point. Thank you so much for your time and your review. Please stop back by for another great dinner any time. We'd love to have you next time your in St.Louis.